What Is Nipah, the Virus Spread by Bats That's Killing People in India? 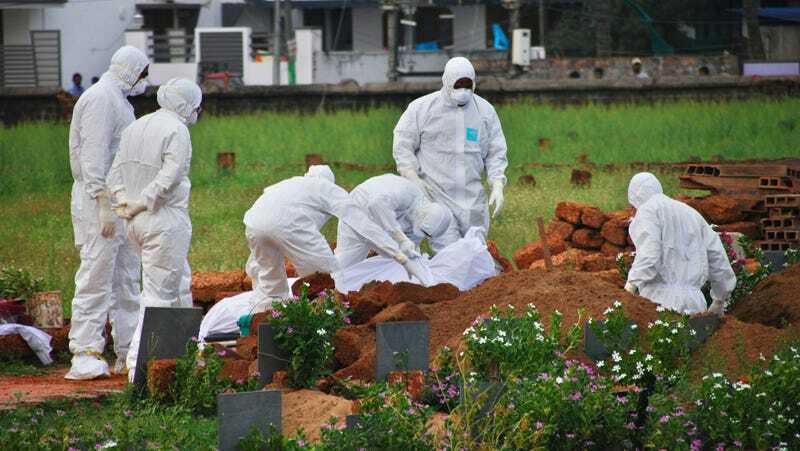 Paramedics prepare to bury a victim of the Nipah virus outbreak in Kerala, India. A deadly viral disease spread by bats is once again infecting humans, but in this case, it isn’t Ebola. As of June 1, an outbreak of the Nipah virus has infected at least 18 people and killed 17 in Kerala, India, the World Health Organization (WHO) reported. The outbreak, which is the first to hit South India, raises fears of the disease becoming more far-reaching. Nipah was discovered in 1998, when it sickened nearly 300 people and killed 100 in Malaysia (its name was taken from one of the villages where it first struck). Many of the victims had been farmers who contracted the virus through close contact with their pigs, which led to the euthanization of millions of pigs. But it turns out the pigs actually got the virus from another animal: It’s now known that fruit bats belonging to the genus Pteropus (otherwise called flying foxes) are the native carriers of Nipah. Not everyone exposed to Nipah gets sick, but those who do develop flu-like symptoms of fever, cough, and headache within three to 14 days after being exposed. Often, the illness gets worse quickly, with sufferers developing pneumonia, acute respiratory distress, or neurological symptoms like seizures and coma within a day or two. There’s no cure or specific treatment for Nipah, and its mortality rate can range from 40 to 100 percent. Besides Malaysia, Nipah cases have been found in Singapore, Bangladesh, and India. These outbreaks have been scattered and small so far, with around only 600 cases recorded between 1998 and 2015, according to the WHO. But it’s possible that Nipah could someday follow in Ebola’s footsteps and spark a much larger wave of infections. The bats that spread Nipah aren’t limited to the countries where it’s been spotted so far. Gurley notes that Pteropus bats live throughout Asia and East Africa, an area that is home to two billion people, nearly a third of the world’s population. And these same bats can spread a closely related virus known as Hendra, which was first discovered in Australia. There’s also the need for longer-term strategies against Nipah, such as a preventive vaccine. Several experimental vaccines have been shown to be effective against both Nipah and Hendra in animal trials, including a vaccine that was licensed for use in horses in 2012 by the Australian government. But no Nipah vaccine has ever been tested in humans. Any human trials would be hard to pull off, given how sporadic and limited Nipah outbreaks have been. But a lack of research funding and political interest has also slowed these efforts, Gurley said. Recently, though, that might be changing. In the wake of the current Kerala outbreak, the nonprofit Coalition for Epidemic Preparedness Innovations (CEPI) announced it was providing $25 million in funding to two US pharmaceutical companies to develop and test out the Australian vaccine in people. CEPI, which is funded through several governments and private charities, including the Bill and Melinda Gates Foundation, has similarly invested funding in vaccine research for other diseases, such as Lassa and the virus responsible for Middle East respiratory syndrome (MERS), since its founding in 2017.